Where are you from? I’m from Baltimore County, Maryland. Where do you live? I’m currently attending medical school in Knoxville, TN but will be moving back home to study for my Step 1 board exam. Then I will be traveling for my clinical rotations. I’m going to be a bit of a nomad for a little while. On cute little mountain towns: Bariloche, Argentina is my favorite place of all time that I’ve travelled! It’s this beautiful mountain town, and whether you’re into skiing, hiking or just walking around shopping and eating, there are gorgeous mountains all around, with crystal clear water and green forests. In town there’s this incredible candy shop, named Mamushka, that is plucked right out of a scene from Charlie and the Chocolate Factory! On an uneventful, but meaningful coming out: I’ve always known I was gay and that my family and friends knew as well. I had a gay uncle and have cousins that are gay and lesbian. After hearing an interview by a mom of one of the victims of the Orlando Nightclub shooting, I finally had a sit-down conversation with my mom. It was easy and uneventful and took place sitting in my Mom’s bathroom while she irrigated my clogged ear. I also sandwiched our conversation between reveals of my latest tattoos. She was more shocked about my tattoos than my coming out - my being gay was an unspoken fact, but the tattoos were brand new! And that’s how I said it, as if it were a statement, to my mom and any other family member or friend. I’m gay. It wasn’t an invitation for questioning or discussion, it was a statement of MY truth, that, understandably might take some time to comprehend and digest, but won’t change. I didn’t want anyone close to me to think I was ashamed of being gay just because I hadn’t said the words aloud. Silence allows for the creation of a false narrative, and I didn’t want there to be one surrounding something that makes me human, unique and worthy of love and belonging. On being comfortable within the gay community: It was fear of being accepted into the gay community that kept me from coming out sooner. I was overweight in my early 20s, and looking at images of the guys that frequented P Town or Fire Island, Barry’s Bootcamp or Soul Cycle made me hesitant to even believe that I’d be accepted - I was the ‘fat theater science nerd’ juxtaposed to the cool good-looking guys. It is worth mentioning that even though the gay community is a marginalized one, there exists a judging or shaming of its members. For example, placing character attributes or implicit biases and monikers such as “gold star, dairy queen, top, or bottom.” Individuals hide behind the term “preference,” to express their predilections when really, it’s a way to justify homogenizing social groupings or dating prospects. We can say it’s due to wanting to be around similar people, with a related background or potential shared experiences, but when did doing that help us grow or better ourselves? I’ve just now, over the past two/three years, gotten comfortable within the gay community, having accepted my flaws while championing my uniqueness; I’ve moved from a timid outsider to the curious and open wanderer. On the importance on having an ally, and learning from life’s obstacles: Prior to having my “official” sit down with my family and close friends, I was outed by a classmate. We got into an argument one night, and, even though we agreed to keep everything quiet, he got into a taxi with some of our mutual friends and told them that we had been together and gave intimate details about us “hooking up.” I learned about what he had done because a friend just happened to be in the taxi that night. She will forever be someone I hold close to my heart, for many reasons, but because in that moment, she showed me the definition of true friendship- an ally against hurtful and potentially damaging hate speech and a source of support and understanding. I still think she was more bothered by the event than me. I, however, wasn’t even mad and still am not. That was a noteworthy moment that I draw strength from because at that time, I realized I was fully accepting of myself as gay and didn’t care who knew. As for moving forward from this situation and continuing on with my life, I viewed this as any other hurdle or obstacle and haven’t let it define me. I learned the lesson I was meant to learn- I dealt with forgiveness and am proud of the person I am because of it. On the importance of “marble jar friends”: I am incredibly fortunate for the people I have in my life that I call friends and family. We are born into a family but as we grow and mature as adults, we have the ability to choose the individuals that make up our inner circle. My “marble jar friends,” as Brené Brown calls them, are as diverse in thought as they are in their cultural and ethnic backgrounds. These are the people that want for me what they want in themselves; to be seen, heard, and know I matter. 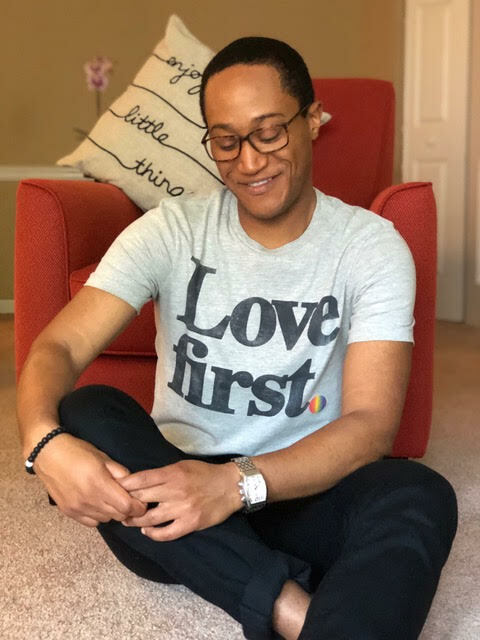 On living his truth, despite what others think: My family and friends have been nothing but supportive, and most conversations center around if I’m dating (yes, I’m single) and when I intend on getting married. The little backlash I have received has been mostly from members of the Black community. A few black professionals have messaged and said that, “I’ve disqualified any future accomplishments I will achieve as a part of the medical community because the only thing people will see me as is a gay black man.” I vehemently disagree with their statements, but understand that in the Black community there’s still a stigma about being gay. Some individuals would rather stay on “the down low,” as if openly being gay hurts the black male professional diaspora. But I am the sum of ALL of my parts, not the convenient choosing of a few. I can’t control what people see or choose to focus on when they look at me, discuss my accomplishments, etc. I can only live and shine in my truth; that will have to be enough. On the role of the medical community when it comes to LGBTQ healthcare: The medical community has a responsibility to educate, care for, and provide adequate healthcare to the LGBTQ community, which includes promoting PrEP. I think it starts with the family practitioner, the physician that sees a patient from childhood into adulthood, to not view heterosexuality as the default. Asking a patient, “Are you sexually active? With men, women, or both?” gives permission for an answer not constrained by judgment or preconceived notions but of openness and vulnerability. As a future healthcare provider, I have a duty to stay educated and advocate for my patients. I know that my experience is unique and has left me poised to reach a population of patients that may not feel like their needs are met or their voice heard by healthcare professionals. I will take my role seriously and do my best to make sure that every individual has access to healthcare that best addresses their needs and concerns. On destigmatizing mental health: The best thing I ever did was decide to go to therapy. I’ve consistently seen Shannon, my therapist, over the past two years. There’s still a great deal of stigma surrounding mental health, as if you should be ashamed to take an introspective look at yourself, your relationships, and those around you. If anyone has looked at #foreignfriday on a Radiologist’s Instagram, trust me when I say there’s nothing you have to be embarrassed about sitting and talking to a therapist. Sometimes we need to develop strategies on how to handle our emotions or triage a situation with respect to what needs and deserves our attention first. And sometimes we just need to vent our frustrations in a safe objective space. Whatever the reason, stability and strength starts from within and you’ll be eternally grateful for taking the necessary steps to ensuring both when you prioritize your mental health. On living in the south: Living down south has taught me the importance of communication and understanding. We can’t ask of others things we can’t or don’t ask of ourselves, and we need to be open to having tough conversations with people of differing views and opinions. Where I might not feel comfortable walking down the street holding my husband’s hand down here, I have really embraced the old saying “you can’t judge a book by its cover.” Even after living on a Caribbean island where it is STILL illegal to be homosexual, I’ve never been this aware of my blackness and being gay. But I’ve challenged myself to look past the differences that divide us and seek the aspects of our humanity that bring us closer together. I’ve fallen in love with a guy from Knoxville and had my heart broken as well. I’ve been able to foster and find community through service and the running community. I’ve grown and am a better person for having lived down here. On his biggest inspirations: I’m a huge Brené Brown fan-she’s my spirit guide. Her work over the years has guided me through so many unexpected turns and over impossible hurdles. Her work, along with my friends and family, whose voices have been louder than my own in times of doubt, have kept me going. I don’t know where I’d be without them, and there aren’t enough words to explain what their love means to me.